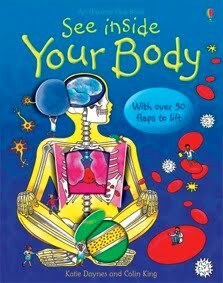 I was looking for Pinnochio story book when I happen to chance upon this book, Usborne's See Inside Your Body, I thought it will be an useful book to get for Little DinoEgg since he shows interest in how a human body works. This book cost $20+ and with my Kinokuniya card's 10% discount, its slightly over $20. And I was right! This is his bedtime story tonite! Happily listening to daddy explaining, lifting up the flaps to see the "inside" and asking loads of questions.